Solasta are an outstanding folk ensemble who are fast building a name for themselves on the back of their inventive arrangements, unique sound and exhilarating live performances. Join them at The Harrison for a special intimate duo show! Each member is an outstanding instrumentalist and sought after performer in their own right. Elisabeth Flett has performed with a variety of bands and ensembles, including folk duo Shamblestone (BBC Radio 2 Young Folk Awards 2017 Semi-Finalist) and sea shanty band The Mead Men, supported bands such as Breabach (Letham Nights, 2013) and won the 2015 London Fiddle Convention Senior Fiddle Championship. 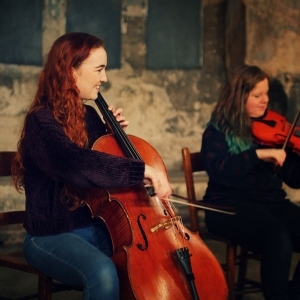 Cellist Hannah Thomas regularly performs on the West End production of Wicked, and has played at venues such as the London Palladium and Hackney Empire.